So two weeks ago this epic hike finally happened. When we booked the trail in January, six months seemed like a long time. Of course time flies when you’re having fun and the six months snuck by in no time at all, or so it felt. My parents are amazing and had already offered to come out to the island to drive us to the trail (of course when they made this promise they’d been hoping to hike some of the trail themselves as well, but the dog got in the way of that). We headed out to make the 10am orientation at Gordon River. 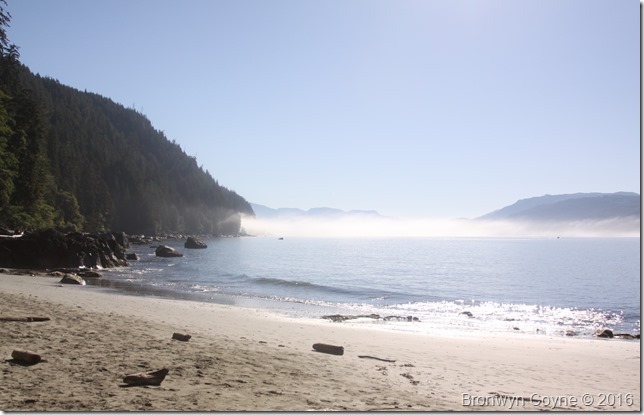 The check in and orientation are required for all hikers doing the west coast trail. You register months in advance because only a limited number of people can start on the trail from the three trail heads each day. This day was some tough hiking! We’d heard that the first five kilometers were “all ladders”. But we found there weren’t as many ladders as we expected. This day was TOUGH however with lots of up and down and some tough trail. 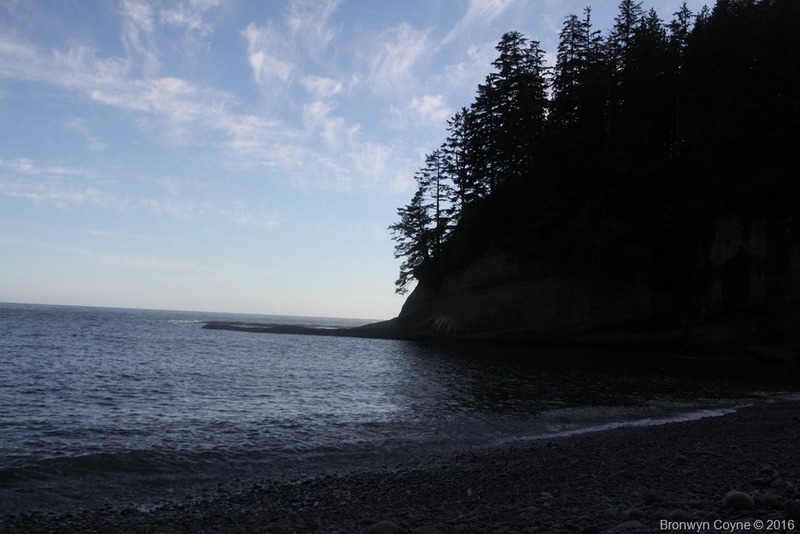 It reminded me a lot of the Juan de Fuca. 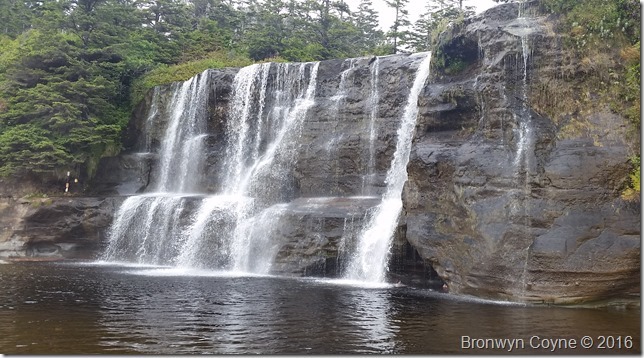 We reached our camp in just under four hours and spent the rest of the afternoon and evening enjoying the beautiful view of Port Renfrew, and the river otter playing in the surf. 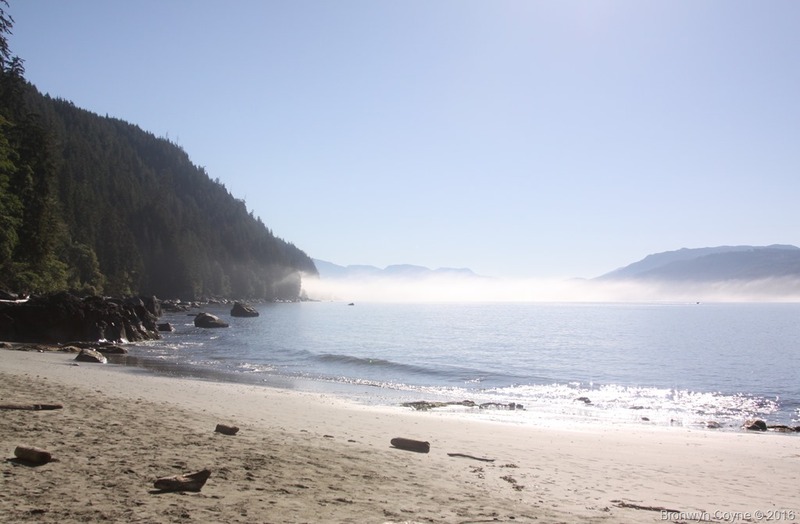 Fortunately the tides worked out for us to do a lot of the beaches throughout the hike. The “beach” after Thrasher cove was all boulders, followed by sandstone once we passed Owen Point. It was a gorgeous day; sunny and bright. I loved the boulder hopping and climbing, don’t ask me why I just love it anytime. The sandstone was a nice fast walk, while watching out for the surge channel created by the water – some you walked around and some you could easily hop! Once we were back on the trail it got tough again; lots of mud, lots of trying to find our way through puddles, up and down and ladders! 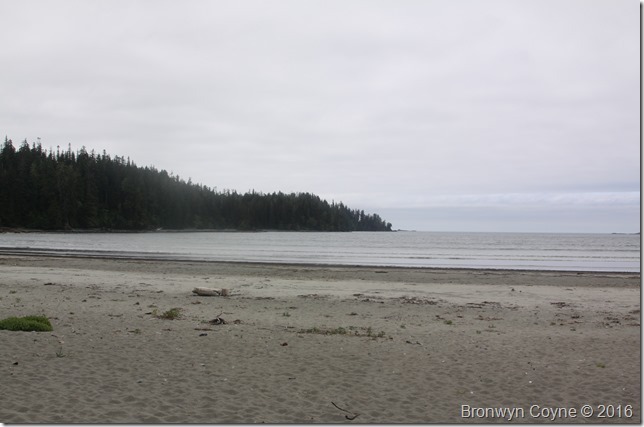 Originally we’d planned to go all the way to Walbran this day, but when we reached the turn off for Cullite we decided the smart choice would be to stop early (this had always been our plan B, depending on time, our energy levels and all that). Cullite was a smaller campsite in a tiny little cove with a rocky beach surrounded on all sides by what looked to be sandstone cliffs. From the way the waves pounded you could just imagine the ocean carving out this little sliver. We had a quick dip in the creek while the sun could still reach us, then dinner then sleep. The next day we set out to get to Cribbs Creek. 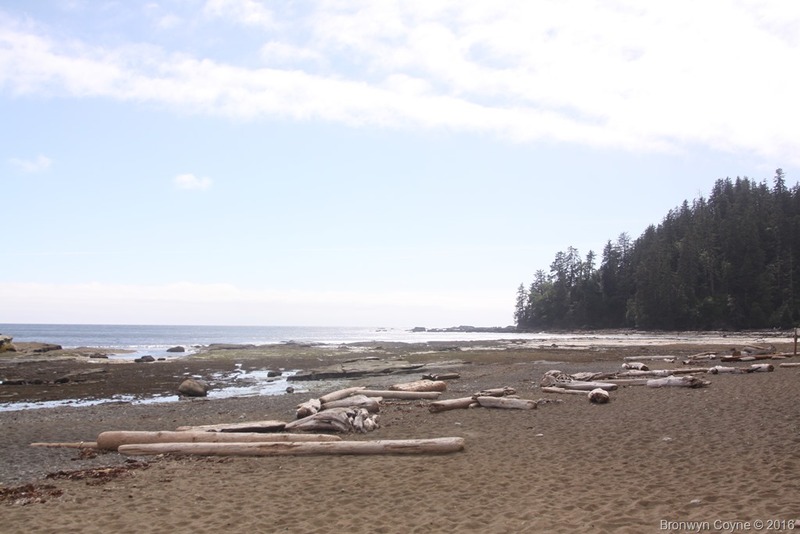 According to most people we’d talked to and the orientation, after Walbran it would be “easy hiking”. The trail would get a lot flatter and there would be much more time walking on the beach. Our third day we woke up to a layer of fog, that just never lifted. 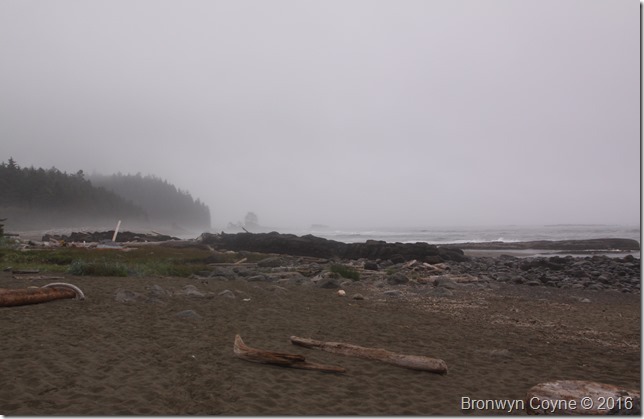 We made good time to Walbran, and could see why this was one of the more popular camps to stay at; there was a nice large pool that would have been so inviting if there had been any sun out that day, sadly the fog meant we didn’t really feel like a dip or a break. 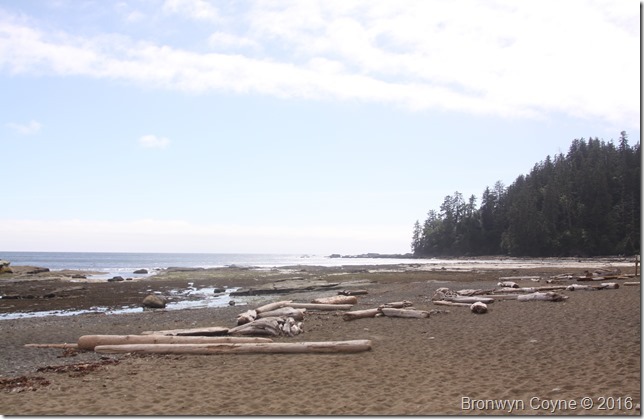 From Walbran to Cribbs is almost all walking on the beach. 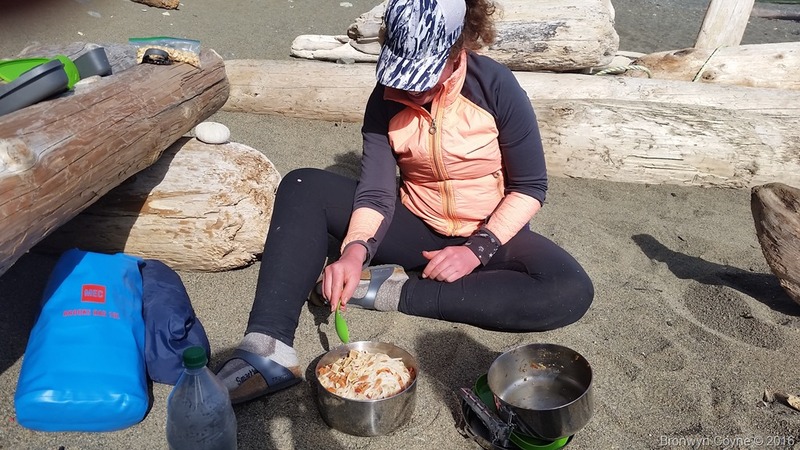 You might think beach walking would be easy, but with a 40lbs pack walking on sand it feels like the soft beach is just eating up any momentum you might have. So while we’d been expecting some ease after Walbran it still felt rather difficult. On this day we also hit the famous “Monique’s” where you can purchase burgers, beers and other treats you might be missing. It was yummy to have something other than our prepared food (though, in my humble opinion we ate pretty well for hiking!). My veggie burger was something like an omelette on a bun but I still enjoyed it. The highlight might have been the pod of Orcas we saw on our way down the beach. They were heading our way so we were able to keep an eye on them for a while too. Sadly I didn’t have my camera out to capture a good shot – and it’s always so hard to get a good picture of orcas anyway. 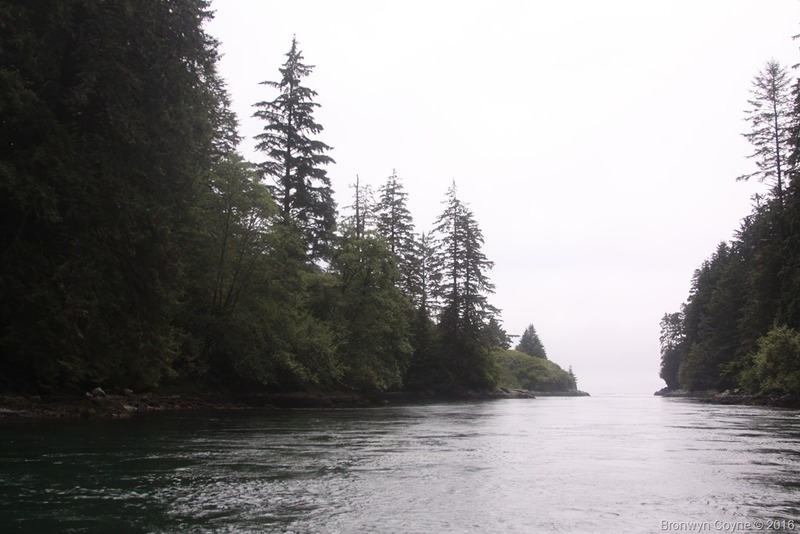 Cribbs Creek is near a sea lion pull out rock, so we also got to watch them do their hunting in the waves that evening while we hung out with new friends around the fire. Yet more fog! This day was not terrible. We still had some beach walking, but we also had some good trail walking as well, with lots of board walks leading us to the lake crossing at Nitinat. There we were able to buy some more delicious grub, this time fresh caught halibut and a baked potato. There is nothing like food when you’ve been hiking all day. The sun also decided to break through the continuous fog for our lunch break, sadly it returned to hiding for the rest of the day. After a short boat ride to the rest of the trail we had a little bit of up and down, that while difficult was nothing compared to the south end of the trail… Plus it was followed by a couple kilometers of beach walking which just sucked the remaining energy right out of us. 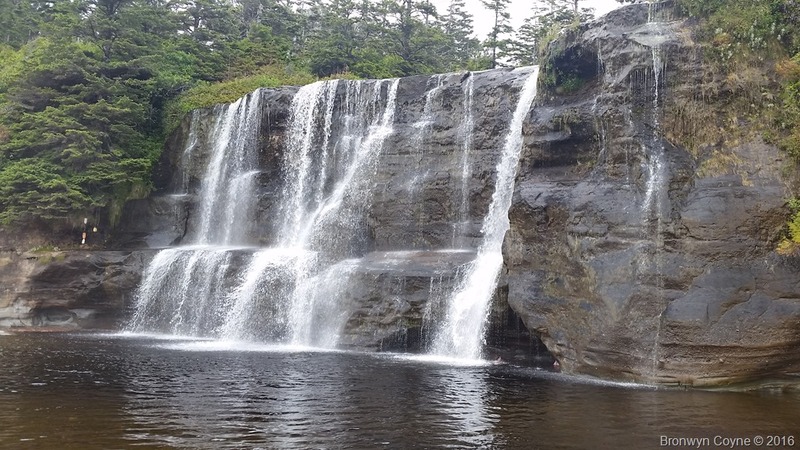 Tsusiat falls was beautiful and I cannot imagine how beautiful it would have been in the sun! Still the cool cloudy weather didn’t stop us from a quick dip in the water, which was so so refreshing after all the day of hiking. And of course we had a beach fire to return to after that, so really it wasn’t a struggle at all. Our second to last started with – you guessed it- fog. At this point the piece that annoyed us about the fog the most was how damp everything was when we woke up. This day wasn’t physically demanding, but I did find it difficult, despite the nice trail it never felt like we got very far very fast and despite it being one of our shorter days it did not speed by. Fortunately we did make camp fairly early, at the last campground before the exit Michigan Creek. As we set up camp, made a fire and lounged around the sun actually broke through the clouds! It was so nice after all the days of clouds to see blue skies. Dinner this night was Pad Thai, a recipe I wasn’t sure would turn out, but it did! I will hopefully get around to posting a little bit more about the food we ate and maybe some of the recipes I used/created – this was something I did not find a lot of information on and I know it can be very helpful! The last day zoomed by. This part of the trail is often used by people day hiking out to the Pachena Point lighthouse so it was wide, and well maintained. I’m sure we had an extra surge of energy since it was the last day and we knew warm food, clean clothes and eventually a real hot shower awaited us. We were actually a good two hours faster than I’d estimated it would take us, and serendipitously my parents arrived just mere minutes after we arrived. Yay! 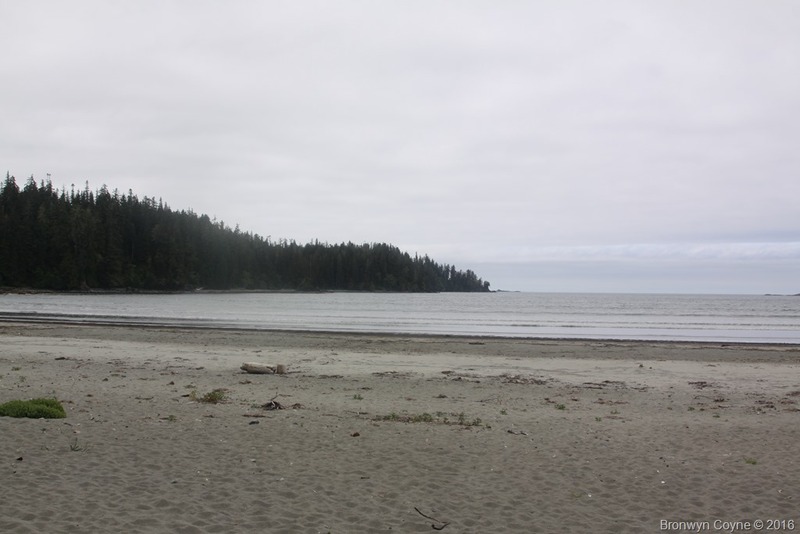 And we discovered that the Pachena Bay campground had showers – double yay. 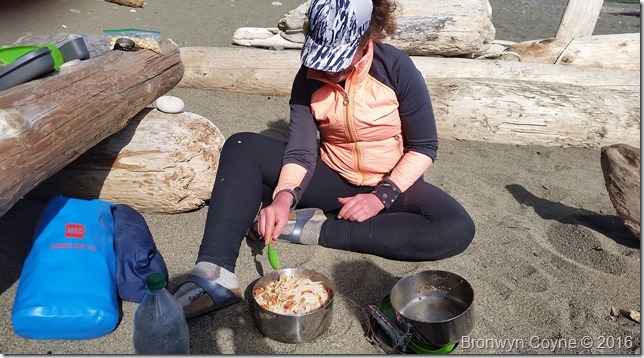 So once we were clean, and all wearing our clean clothes we headed for some food in Bamfield. Overall I loved this experience and cannot wait to do it again! It was beautiful, challenging and tough, but absolutely worth every scraped knee, bruise and bee sting (seriously, I got two wasp bites on the last day!). 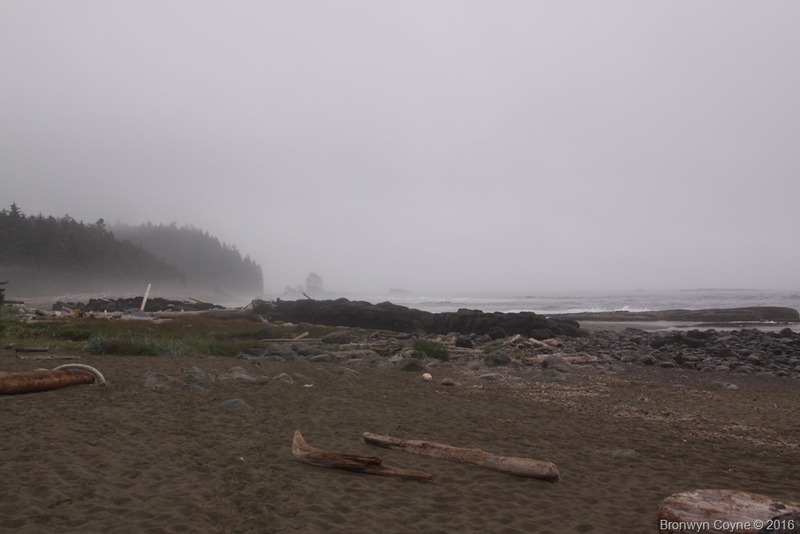 We had good weather for the trail (the other nickname for it is Wet Coast Trail) so despite the fog we really were happy with the experience. Realizing how easy it is to do something like this makes me definitely want to do it again, and others. But if you love multiday hiking it is definitely one you gotta do. Great summary of the trip, Bronwyn!! 🙂 I can’t wait to do it again! Thanks for all your work on the food prep!